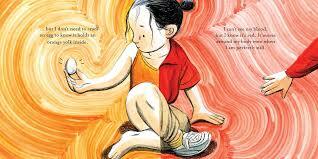 Jillian Tamaki and her cousin Mariko Tamaki were awarded a surprise Caldecott Honor a few year back for their 2015 graphic novel, This One Summer, The win was the first in the history of the awards for that form and for many represented one of the boldest steps forward for the committee, who risked controversy by bestowing the prestigious prize on a book squarely aimed at the uppermost end of the Caldecott audience, the earliest teenagers. The book featured mature themes and very strong language, yet few could deny it’s brilliance both from a writing and artistic perspective. 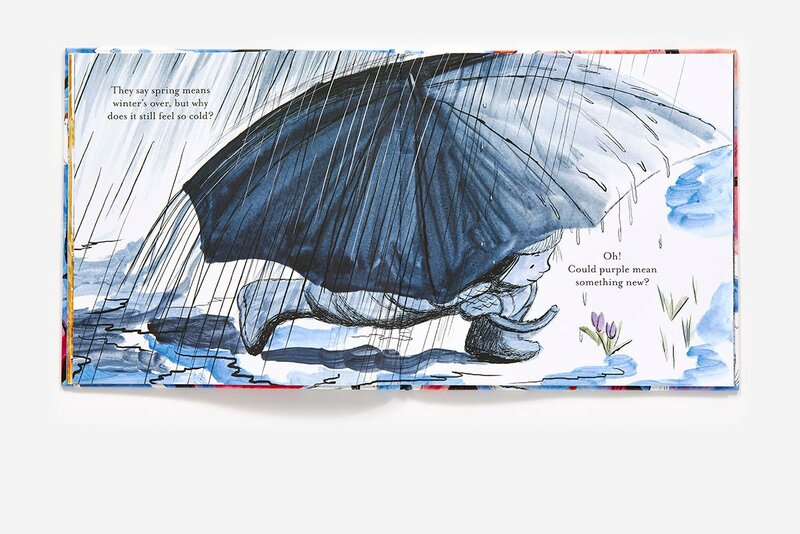 Of course, bringing attention to the graphic novel from a group almost exclusively attuned to the conventional picture book (understandably) was a major inroad towards pictorial diversity and it has opened the door to other possibilities on that front. But those impressed with that work and other books by these exceedingly talented Japanese-Americans could never have envisioned the masterpiece that appeared in picture book land in early 2018. To be sure They Say Blue is a solo effort by Jillian, who illustrated This One Summer. The book has earned spectacular raves, is poised as one of the front runners for the one of the Caldecotts to be announced on the morning of Monday, January 28th, 2019 (a short time from the publication of this review) and hand landed on the end of the year Best-Of lists posted by children’s book critics and sites as well as a major picture book award last year from the Boston Horn Book, whose rules have some time overlap. At least one major luminary, who has served on previous committees, Travis Jonker, has predicted the book would be in the winner’s circle when the announcements are made in a post at the School Library Journal. Few books released this past year are as beautiful on every turn of the page, nor are as fully attuned and immersed in the theme which is maintained from title page to the final glorious spread. The method to produce this frame-worthy art are says Tamaki, on the dedication page at the end is a combination of acrylic paint on watercolor paper and photoshop. This intricate method has produced breathtaking illustrations which are diverse, multicolored and textured to a fault. Though the front cover is compellingly attuned to the book’s declaratory title, They Say Blue isn’t especially about the world’s favorite color, but a call to those in outdoor immersion to stop, to observe, to connect the dots, to understand the nuances of color, temperature, and seasonal characteristics, which are woven by perception but most of all be experience. 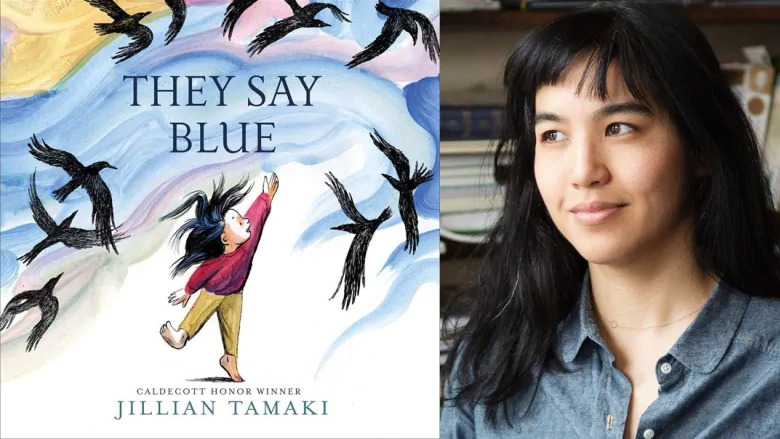 The title page is guided by the wide span wings of a bird and then Tamaki’s observation on the most gorgeous blue expanse one is likely to see in a picture book, a sustained looker to rival what Peter Sis did last year in his Robinson. 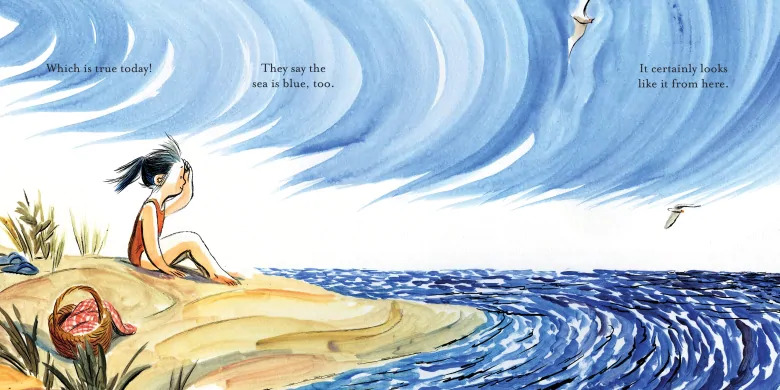 The central protagonist, a young girl with an uncanny ability to observe and make confident conclusions is pictured sitting on a beach, confirming what so many others have deduced: They say the sea is blue, too. It certainly looks like it from here. Darkened blue-paneled waves seemed to swirl under a lighter shade of blue. Yet the girl finds no blue when she holds the water in her hands. It’s as clear as glass. 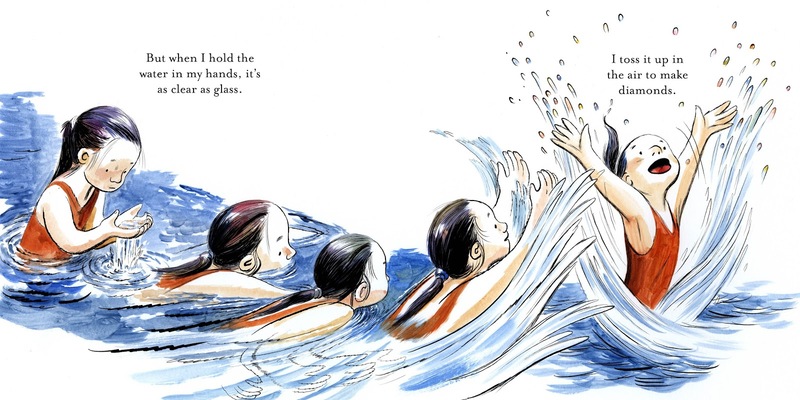 Tamaki injects a brilliant metaphor as the girl tosses up the water to “make diamonds” and the photo is a burst of aquatic exhilaration. The possible fallacy of a blue whale’s color is examined in another breathtaking watery expanse where the girl confesses she never saw a blue whale which is appears in silhouette as a darker incarceration of the color apparently forged by how it appears under the blue pigment. the girls swims in multi-stage vignettes. She is far more certain though based on prior immersion that the yolk inside an egg is “yellow” and though she can’t “see” her blood she knows well it is “red” and that it “moves around my body even when I am perfectly still.” The full page yellow-range and reddish strands are united by a stunning look at the girl who straddles the book’s gutter half in yellow-orange apparel and half in red. The metaphor of blood racing inside a body as provoked by exercise is superbly posed in a scene of kids playing many different games and varying positions, all attuned to the idea adorned in red. Next Tamaki again offers up a visually persuasive metaphor, one applying “a field of grass” to the perceived look of a “golden ocean”, which is subsequently interrupted by grey clouds and rain. After she realizes she can “never build a boat light enough to sail on a golden ocean”, she concludes her imagination got the better of her and that “It’s just plain old yellow grass anyway.” An oversized umbrella is featured in a spectacular canvas denoting early April, a time when winter has departed but also one prone to cold precipitation. This intrepid observer of clues opines that a purple flower provides more concrete proof of a changing season. Winter receives the final nail in the coffin with the double page tapestry of the girls shedding themselves of their coats, scarves, boots and umbrellas. Yet another brilliant metaphor brings together a girl and a tree when the former stretches to the sky with her fingers open wide and after she completes this glorious metamorphosis she sprouts. The sounds, propensities and activities of summer are envisioned in an around a clearing with green and insects in full regalia. Successive panels showcasing fall and winter, with the latter getting a double page encore in one of 2018’s most spectacularly beautiful canvasses denote for the girl an instance where the difference between land and sky is blurred. But then in a more clearly delineated situation she knows well that black is the color of her hair and that her mother parts it every morning, “like opening the window” in towering metaphor shown by another unforgettable color convergence spread. With her mother she watches “black crows bob and chatter in the field outside.” Like many children she wonder what outdoor creatures might be thinking as Tamaki closes in on a flock of crows in emblazoned orange who rule the skies. Arguable the saturated, metaphysical “Tint inkblots on a sea of sky” is the book’s pictorial showcase and hence of the most unforgettable canvases of the year but because They Say Blu is such a consistently stunning work of art throughout one might offer up other examples of masterful illustrations. And then there is the inside cover, which for some might recall Richard Bach’s Jonathan Livingston Seagull, but on its own terms is a the highest representation of pop art on the cover of a picture book. Enough superlatives? Well, They Say Blue has earned them and then some. We’ll know soon is a gold or silver sticker will be permanently affixed to the cover. Note: This is the twenty-eighth entry in the 2018 Caldecott Medal Contender series. The annual venture does not purport to predict what the committee will choose, rather it attempts to gauge what the writer feels should be in the running. In most instances the books that are featured in the series have been touted as contenders in various online round-ups, but for the ones that are not, the inclusions are a humble plea to the committee for consideration. It is anticipated the series will include in the neighborhood of around 25 titles; the order which they are being presented in is arbitrary, as every book in this series is a contender. Some of my top favorites of the lot will be done near the end. The awards will be announced in late January, hence the reviews will continue until around the middle of that month. I’ve long expected this book to appear in your series as I have it near the top of what I consider the best books of 2018. You have provided it with a banner review, which doesn’t surprise me. I am getting the feeling this isn’t the very last review in this series either. 🙂 Great job Sam! When I first aw this book it blew me away to employ a pun. I think it deserves to be one of the winners. A fantastic review again! Sam, your selection for advanced children is very engaging. But we have to be aware that the optics probes here could be scrimping on the depths firing out at full blast for little kids and their parents. As I stated on Facebook, where you provided the link, this is one of my top books of the year. Thanks for that fascinating, thorough review.